Before and after the Hamas military take over of Gaza in summer 2007, some analysts still differentiate between the "military" and the "political” wings of Hamas, drawing on the similar distinction in the IRA to prove their case. Analysts who make such a distinction regularly dwell on the "good works" of Hamas, as though these activities had no connection whatsoever with the attacks on civilians and the suicide bombings that are the trademark of the organization. Because of the notion that Hamas has independent "wings," its political and charitable fronts are allowed to operate openly, and European and Middle Eastern governments are willing to conduct political contacts with the “pragmatists” who lead the Hamas government in Gaza. The common argument, which is being used by those who wish to ease the suffer of the siege posed on Hamas in Gaza, is that the “politicians” are not connected to the military wing and as such there is no reason not to deal with them as they are not terrorists. Long assays and articles where published about the question whether Hamas operate within two distinct and separate “wings”. Matt Levitt published one of the most comprehensive articles relating to this basic question. In the article, Levitt proved, based on Hamas’s statements, declarations and interviews that such separation or distinction does not exist. According to Levitt, Hamas’s leader Sheikh Ahmad Yassin has rejected the idea that Hamas has uncoordinated wings: "We cannot separate the wing from the body. If we do so, the body will not be able to fly. Hamas is one body." Hamas leaders themselves frequently acknowledge the central role that their "political" leaders play in the group's operational decision-making. Hamas military commander Salah Shihada (killed by Israel) put it this way: "The political apparatus is sovereign over the military apparatus, and a decision of the political [echelon] takes precedence over the decision of the military [echelon], without intervening in military operations." Another Hamas leader, ‘Abd al-‘Aziz Rantisi, in July 2001 told Reuters, "The [Hamas] political leadership has freed the hand of the [‘Iz ad-Din al-Qassam] brigades to do whatever they want against the brothers of monkeys and pigs [i.e., Jews]." According to the Reuters article, "Hamas's political wing determines overall policy for the movement." According to Israeli court documents in the 1995 extradition case of a Hamas leader from the United States, "the [political] bureau operates as the highest ranking leadership body in the Hamas organization, setting policies and guidelines respecting Hamas's activities. 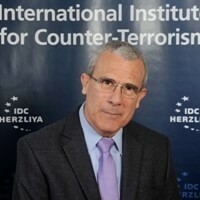 In addition to its other functions, this bureau has responsibility for directing and coordinating terrorist acts by Hamas against soldiers and civilians in Israel and the territories." The United States government has also come to share this view. In the Treasury Department's August 2003 announcement designating six senior Hamas political leaders and five charities as terrorist entities, it asserted, "the political leadership of Hamas directs its terrorist networks just as they oversee their other activities." In the case of Hamas, there is abundant evidence that the military wing is accountable to a political steering committee that includes Sheikh Ahmad Yassin, the group's acknowledged "spiritual leader," as well as spokesperson such as Ismaeel Abu Shanab, ‘Abd al-'Aziz Rantissi, and Mahmud Zahar. Yassin himself, as well as Salah Shihadah, the founder and commander of the ‘Iz al-Din al-Qassam Brigades, have confirmed in public remarks that the military wing implements the policies that are set by the political wing. Since Hamas’s victory in the elections for the Legislative Council in the democratic elections held in 2006 and their overtaking of the rule in Gaza in the summer of 2007, the organization has worked at presenting a distinction between the “political” array and the “military” array dealing in terrorist and guerrilla activities. A recent distinct example for Hamas’s failure to blur the involvement of senior “political” figures in the “military” field is demonstrated in the case of the Hamas Minister of Justice and the Minister for Palestinian Prisoners (held in Israeli prisons) Dr. Ahmed Diab Shwedakh who passed away suddenly at the age of 49 from a heart attack on October 1st. 2008. The Minister of Justice was rushed to a hospital last ‘Id Al-Fiter in critical condition. The Hamas leadership in Gaza and senior representatives of the Hamas government came to the hospital to his bedside. The day after his death, various terrorist organizations including the Palestinian Islamic Jihad and the Popular Resistance Committees Organization published obituaries. The Islamic Jihad leader, Ramadan Abdullah Shalah, published an announcement stating that Dr. Shwedakh was a prominent Islamic Sharia scholar who was also known to be an Islamic warrior (Al’ Aalem Al Mujaheed-Arabic) whose life was characterised by giving and by Jihad and his activities contributed to the world of Jihad. After his sudden death, various entities published obituaries mourning his early demise and an analysis of these publications provides new insight proving the Minister’s (who allegedly is a “political” figure) level of involvement in the military activities of ‘Iz al-Din al-Qassam Brigades in Gaza. Born in 1959, received his doctorate in 1977 from the Um Durman Islamic University in Sudan in Sharia studies. Appointed by Hamas as Minister of Justice and Minister for Prisoners also dealing with the released prisoners in the Hamas government in Gaza. Before his appointment he was the head of the Sharia College in the Islamic University in Gaza (known as Hamas stronghold in Gaza). His religious education and experience provided him with his lofty and important position as Islamic Religious Law ruler and as a source of inspiration, a fact that brought on his appointment as head of the Religious Islamic Law Jurisprudence Committee (Lagnat Al Iftaa-Arabic) of the Islamic University in Gaza. In addition, he headed the Islamic Religious Law Jurisprudence Department in “Scholars of Palestine Association” (Rabitat Ulama Filastin-Arabic) which is identified with Hamas, whose large part of its members are prominent Hamas leaders heading also Islamic Charitable Organizations (Zakat Committees) that serve as Hamas front organizations in promoting Hamas’s objectives through educational and welfare activities, some of which were also deported by Israel in 1992 to Lebanon. During the last Ramadan Fast (September 2008) the Minister made two visits to the ‘Iz al-Din al-Qassam Brigades in Gaza and joined their activities. The Hamas Internet forum published on October 11th 2008 a cluster of photographs under the heading: “Jihadi photos of the Minister, the Mujaheed and the Islamic law scholar Dr. Diab Ahmed Shwedakh” during his visits with the ‘Iz al-Din al-Qassam Brigades. In the photos the Minister of Justice appears dressed in combat guerrilla spotted fatigue, carrying an M-16 weapon, a Kalashnikov gun (AK-47), wearing a hat with ‘Iz al-Din al-Qassam Brigades insignia, and a cluster of photos where he is seen with a group of masked warriors. The forum stated that these pictures, published for the first time, show the Minister of Justice in his Jihad activity. The heading in the Hamas online forum states that the “Mujaheed Minister of Justice” has made two visits near the end of the Ramadan Fast (September 2008). The Minister who was a beloved Mujahideen was close to them, linked his soul with their soul and viewed them as his sons. The online forum also published a poster in memory of the late Minister of Justice “The Religious Islamic Law Guide”, which included a number of notable elements. The center of the poster shows a photograph of Dr. Shwedakh as a religious Muslim scholar in religious uniform providing his image the Islamic religious aspect, alongside this photo appear three photos of the Minister dressed in military garb holding a weapon providing his image the military aspect of his activities and his involvement that garnered him the title “Mujaheed”, and in the top right hand corner appears the photo of the Hamas prime minister in Gaza and Hamas leader Ismaeel Haniya, a fact demonstrating the link between the Minister of Justice and the Hamas leader and the close and inseparable connection between the military and the political aspects of Hamas leadership. The material published by Hamas entities clearly points to the fact that there is no separation between the political echelon and the military echelon and that they have a symbiotic relationship, in contrast to the false representation made by Hamas striving to divide them in order to achieve legitimacy from various governments and entities around the world. The attempt at creating a division is artificial and misleading and it originates from Hamas’s wish to hide and mislead, as a result of the organization’s wish to win political acknowledgment and recognition, acknowledgment that will be followed by financial support and aid that will serve the strengthening and rejuvenating of the Da’awa and Jihad activity. The publication of the Jihad photographs of the Minister of Justice are proof of the direct involvement and the religious and political inspiration provided by the highest levels in the Hamas government and leadership to the ‘Iz al-Din al-Qassam Brigades engaged in terrorist activities. The case of the late Hamas Minister of Justice proves that Hamas still functions as a unified entity, with the military operatives subservient to the political leadership. Matthew A. Levitt, “Hamas from Cradle to Grave” in Middle East Quarterly, Winter 2004. http://www.meforum.org/article/582. "U.S. Designates Five Charities Funding Hamas and Six Senior Hamas Leaders as Terrorist Entities," Office of Public Affairs, Department of the Treasury, Aug. 22, 2003, at http://www.ustreas.gov/press/releases/js672.htm.